At Domotex all the major suppliers come together every year to present the complete range of floor coverings available worldwide. In 2012 DOMOTEX will highlight a new concept focussing on a specific keynote theme that alternates every year. The cycle begins in 2012 when the product category embracing laminates, parquet and other wooden flooring boasts a platform appropriate to the modern products on show: the Wood Flooring Summit. The Wood Flooring Summit 2012 will bring the best of the parquet and laminate industries together with specialist suppliers of other types of wood flooring. Arrow Wood will be present at this trade show. 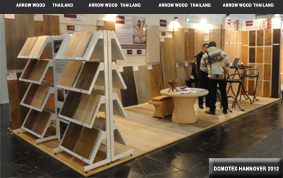 At this trade we will present the latest developed wooden floor materials, products and colors. We will meet you at de Domotex 2012 in Hannover……..